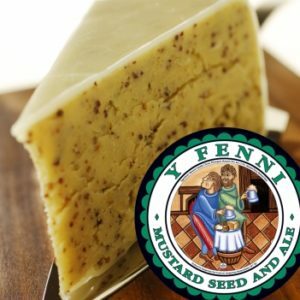 The second instalment of our Wales month, this week’s cheese is Y-Fenni. It’s a Welsh cheddar full of mustard seeds and a generous lug of ale, and makes a great start to a Welsh rarebit. Why not try with a splash of Henderson’s Relish or Lancashire Sauce? Both vegetarian and vegan friendly (unlike another regional sauce, which famously contains anchovies), the former is The Spicy Yorkshire Sauce, flavoured with tamarind & cloves, and the latter Probably the Most Versatile Sauce in the World, mildly spiced with curry flavours like fenugreek and cumin. The Abergavenny Fine Food Company also make Harlech – cheddar with horseradish and parsley – which has become an ever-present in our fridge following a customer request.